Can you tell a number a friend has in his mind without him revealing that number to you? Now you subtract 2 from that number and tell him that his number is 27! What is the mathematics behind that? Can you construct a different method by using different multiplication factor in stead of 2 and also different additional factor instead of 4? There are innumerable numbers of ways, we can formulate above type of tricks/puzzles. Let us now look at some interesting facts about some numbers. 2. Now multiply 123456789 by 2 and we get 246913578. 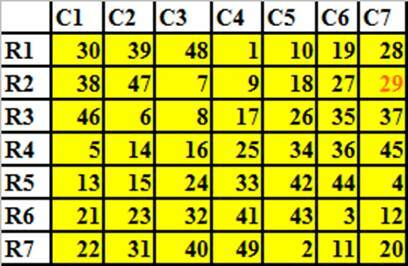 Again sum of individual digits of this number is also 45(=2+4+6+9+1+3+5+7+8) Also note that no digit repeats in the result and no digit is missing between 1 and 9. What do you observe when 123456789 is multiplied by 4,5,7,8? Let us look at the expansion for (n+1)2 for any number. We learn later that (n+1)2= n2+2n+12= n2+(2n+1). First reference to this type of arrangement was formed by Pingala(Period : 2nd BC). He used this concept in Chandas Shastra( Study of syllables). It was called Meru Prastara( Steps of Mountain Meru ). Halayudha a 10th Century Mathematician provided commentary on this arrangement. 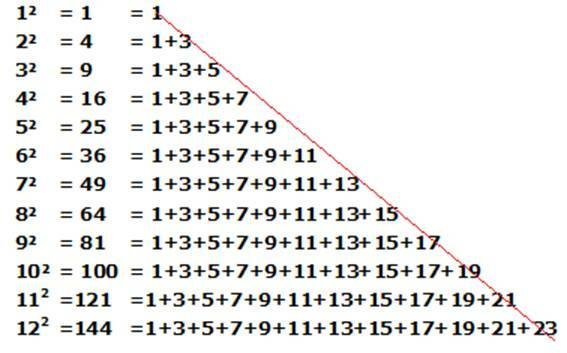 As is the case with crediting all the discoveries of Indian mathamaticians after westerners, this triangle is now called Pascal triangle named after Pascal(17th Century) mach after its discovery and relevance 1900 years ago! Now lets us look at the some of the properties of this Pingalas Meru Prastara. The above series is now called Fibonacci Series named after 12th century mathematician Fibonacci. 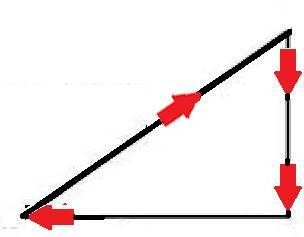 Sum of numbers across 2 diagonals (joined by red line) is also 15. 15 is called magic sum. 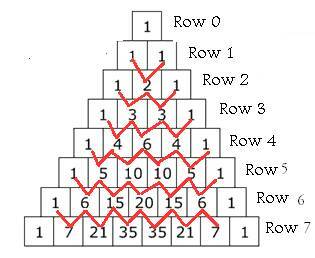 Magic sum is the sum of all numbers in any row/column/diagonal in a magic square. 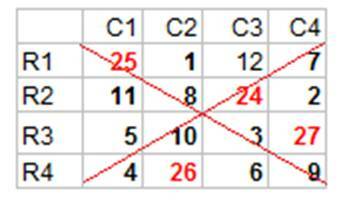 In the above examples, 16 and 29 are marked in red to indicate that only these 2 numbers do not follow the else part in rule 1. In the above figure note that sum of numbers in 4 rows(R,,R4), sum of numbers in 4 columns(C1,,C4) and sum of numbers in 2 diagonals(crossed by red line) are all same and is equal to 45. 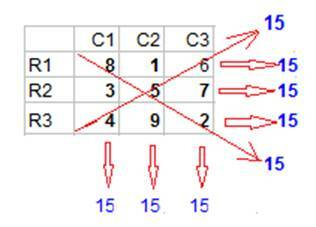 How do we construct such magic squares? Let x be the given Magic sum for which we need to construct the magic square. We use 9 in 4 different ways to fill the some of the squares in a 4 by 4 square. Place 10, 11, 12 in the squares in (R3,C2),(R2,C1) and (R1,C3) respectively as shown in the figure 6. 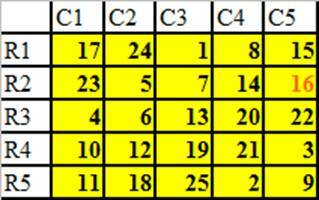 If the magic sum required is X, then place X-20,X-19,X-21,X-18 in (R1,C1), (R4,C2),(R2,C3) and (R3,C4) respectively as shown in the figure 7. Note the following in the figure/step number 7.